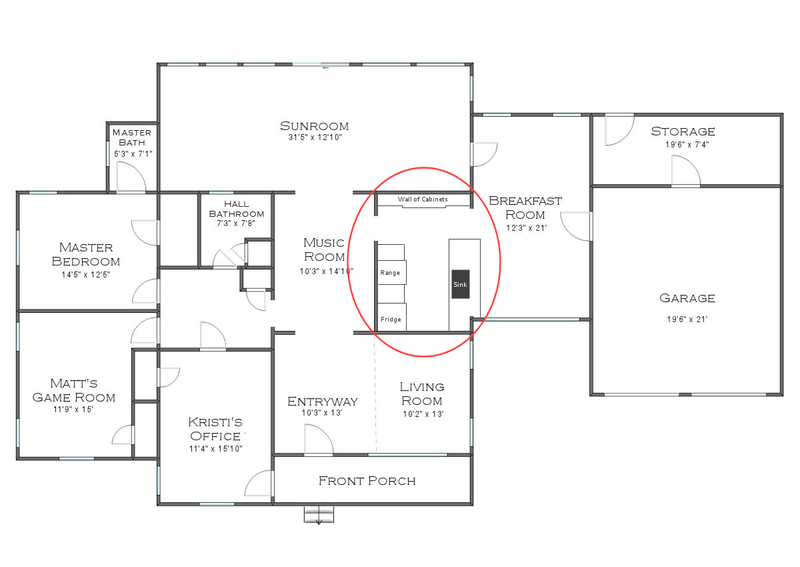 And a zoomed in view of the kitchen and breakfast room floor plan. I was standing in the front corner of the breakfast room to take that first picture above. I spent a good portion of yesterday sanding my countertops. Using my rotary sander, I started with 60-grit and I’ll work my way to 220-grit. And let me tell ya, sanding concrete is a messy job! At least on the first pass it is. But here are a couple of pictures of the difference the sanding made. This is on the peninsula, and the area towards the foreground of the picture (towards the bottom) has been sanded, and the back section has not yet been sanded. You can see that the back unsanded section has a more solid white, almost chalky appearance to it. The front sanded section has more of a grainy look to it. Here’s a look at the countertop on the wall of cabinets. Again, the front section has been sanded, and the back section hasn’t yet been sanded. The sanding did make a slight difference in the color, but overall it still reads as white. Here’s a full view after the sanding, and you can see that the countertop still reads white, and still looks great with the white subway tile. And in that picture above, you can see that I’m also working on a fix for the dent caused by my sander mishap. What you see in that picture is a very quick test of an idea. I was just trying out something to see if it will work, and I do believe it will! I ended up mixing half concrete and half unsanded grout with a bit of water to make a thick paste, and then I packed that paste into a small piece of the edge form. I pressed it tightly against the edge, and then swiped the edge form from left to right, which left the concrete/grout mixture to fill in the dent. Of course, I did this very quickly last night (I took all of about five minutes on it) as a test, and I didn’t get the color just right, so that needs work. But at least now I know for sure that this method will work, and the dent can, in fact, be fixed! Yay! It’ll be another full day of sanding, and hopefully I can get that finished and then get at least one coat of sealer on these countertops. …I just can’t get that paint color out of my mind. It looks a bit brighter than the one I had selected. That one is called Once Upon A Time by Benjamin Moore. I love it. I think I’ll get a sample and check it out just because I want to be very sure that I’m making the right color choice. 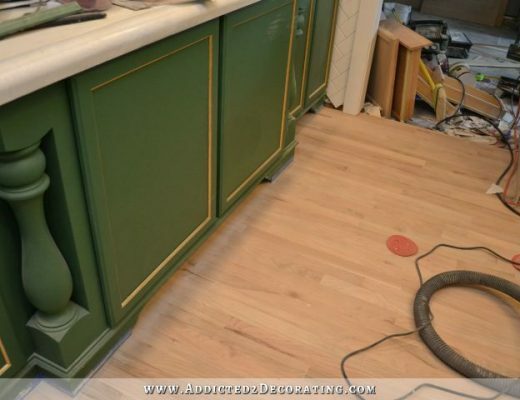 I mean, painting kitchen cabinets is a big job, and painting them green is a daring choice (even for me! ), and I want to get it right. I still haven’t even decided what paint I want to use (all paint companies can color match, so it doesn’t matter where you choose your color). I use Behr for just about anything and everything, but when it comes to kitchen cabinets, I’ve always used oil-based paint. But I’m thinking this time, I’ll actually try latex. Decisions, decision! But for now…sanding…and hopefully some sealing. Previous Post Creating The Kitchen Of "What If....?" You have such talent! love everything you do. That is not a small kitchen and the layout is awesome! I have used latex on my cabinets and they have been fine. Just remember to get an enamel undercoater, behr makes one. You can tint it so it enhances your color. This is not a primer, it is made for being under latex paint on shiny surfaces and high use areas. Otherwise there will be chipping. I used BM Advance when I painted my cabinets. No chipping and the paint feels very high quality. I totally agree. I have this paint on all the doors and trim in my house, and it dries VERY hard. This is the one I’ll be using when I paint my cabinets!! Your kitchen is looking good! I did want to comment on paint brands though. I was a Behr girl for years and years. I still use Behr on walls. I had a terrible time with it on cabinetry. I even used Floetrol to help with the leveling and it still showed brush marks. I also politely disagree about color matching. Each paint company has their own bases so an exact match is impossible. In fact, I once took a lid into HD to get another quart of the same color. For some reason the paint guy color matched it to the swatch on the lid rather than the formula and paint name that was on it. Did not match at all! And this was white! Lesson learned. I stick with the swatch manufacturer. If you are going with semi-gloss I recommend SW Pro Classic. I second the recommendation for SW Pro Classic.You’ll be pleased with it’s durability and ease of use. It’s so exciting seeing it all come together! I’m so happy for you! So glad you could fix the dent! I like the Derbyshire much better than the Benjamin Moore color. Derbyshire reads….classy, elegant. The BM color reads a little to cartoonish to me. Great job on the countertops!!! Have you tried one of those on-line sites that lets you upload an actual photo of your room and then try out different colors? I really can’t see a difference between Derbyshire and Once Upon a Time, but that’s probably because of the lighting. Can you do samples on cabinets like you do with wall color? It’s not even my kitchen and I feel just a tad anxious about choosing the color. LOL! So, how does your new color contemplation relate to the rest of the house? I guess the breakfast room is the main viewing point. Monitors being what they are, it’s difficult to tell for sure, but it sure looks GREEN. Derbyshire for cabinet color…please…it has a much more elegant, classy and rich feel to it. The other is more like a childs bedroom cabinet or something and in the kitchen I’m afraid it would tire and you would ‘outgrow’ quickly. idk I just feel you have such good taste and class, that you deserve to have a rich well established color to gaze upon with a grand sense of accomplishment each time you walk into that gorgeous kitchen, if that makes sense. Hi Kristi: Great job. I wanted to let you know that although paint companies can colour match, their starting base can be different from manufacturer to manufacturer. So just because you like or don’t like the colour in a Behr, you might like it in Benjamin Moore. Also I am sure you know, however just a hint. If you want to save some money on paint have them tint the primer to the same colour. It won’t come out to the exact colour because they are tinting white. Good luck . Thanks. This is the picture I was waiting to see. I love the kitchen setup and the counters. But still, do you think you have enough drawers? Am I the only one who needs lots of drawers in her kitchen? Are you wet sanding? 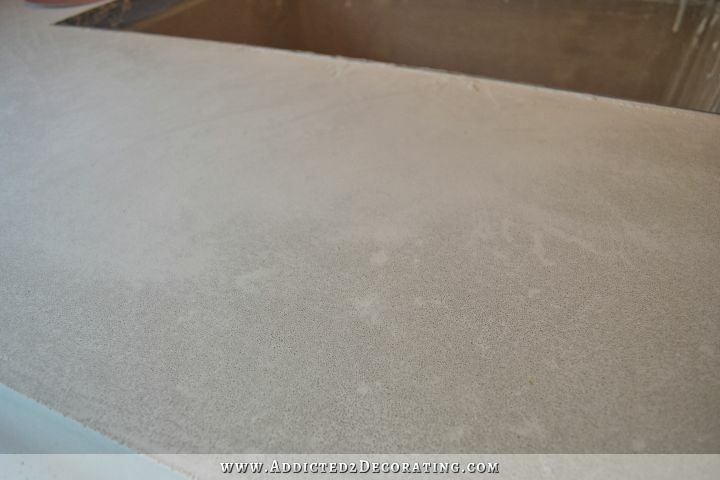 Been researching how to refinish my existing concrete countertops (don’t like the stain, doesn’t seem to be sealed or at least needs to be resealed, and do not like the rough texture). What I’ve been reading says to wet-sand…talk about messy! At least, a different type of mess! Thinking I might like that better though as opposed to the dust in the air and everywhere. A lot of the pros in my area use Sherwin Williams. I have used Behring, Benjamin Moore and Sherwin Williams and I like Sherwin Williams the best. The greens are nice but I would be concerned that with as man cabinets that you have it would get over powering. If I wanted the green I would consider the uppers a different color you might paint base cabinets first and see if green is too much. I like this idea of two colors. It just sounds like YOU, Kristi. Things are coming together beautifully. Do you ever take a vacation!? I’ve been in love with that paint color since you showed it too. It’s cheerier and I think it would make you happy to be in the kitchen. I think it also goes really well with the light colors you’ve been doing whereas the original color you wanted works well with metal finishes. Kristi, it’s the times that I wished I had second guessed that big expensive mistakes were made. Like the time I wanted a golden ivory and instead got something that looked like barbie doll flesh on a two story great room and foyer. I didn’t stop it all because we had invested in a 5 gallon bucket and it was my husband way up there on a little giant ladder. Luckily it was 2007 and the house sold anyway. So second guess away and i will keep enjoying your blog! You do such beautiful work, your an inspiration to me! LOve the countertops by the way! 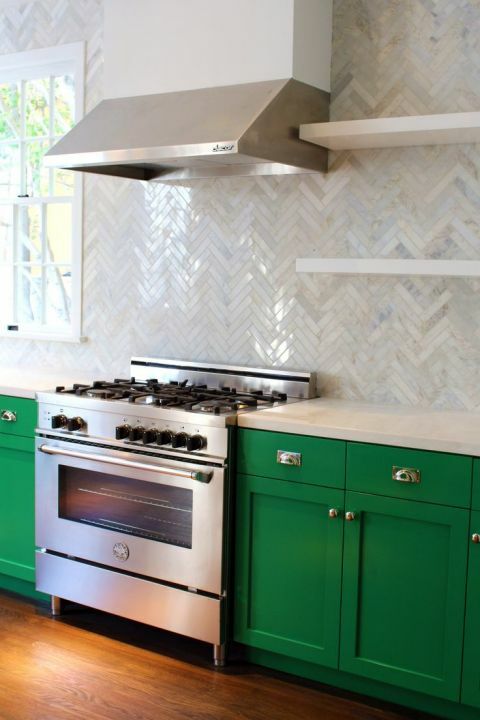 The kitchen with the green cabinets is gorgeous, I just bought that tile to do my backsplash. I say go for the green! On a side note – we had to skim coat some walls with concrete in the past and the sales person told us that concrete won’t stick permanently to concrete unless you use a strong bonding agent first. It was a liquid paint-like substance that we just brushed on. I didn’t want you to perfect those few areas only to have it crumble later!!! Just a couple of thoughts. 1. I agree with those who say to stay with the richer green color. The brighter one looks more contemporary, not vintage. You do have a tendency to second-guess yourself, but please listen to your initial gut reaction and stay with the richer color. I think it will look beautiful once it’s done. 2. I am tickled pink with your repair on the front edge of the countertop on the long wall. Even if it is a little bit lighter, you might just let that go. Once it’s sealed, it will probably blend in and be just fine. But, if you do decide to take it off and do it again, the next time, have you considered drilling some small holes into the dent to fill in and use as ‘anchors’ to attach the repair to the edge? I’ve done that with wood filler when I needed to fill a rather large area on wood furniture. I don’t know if it would work on the concrete, but it’s a thought. Otherwise, what is going to keep the repair from pulling loose and falling off if bumped in future? 3. Will you be adding feet to the peninsula as you did to the other cabinets? I am so delighted with the way the countertops have come out. What a great idea to use concrete, and what a terrific product and company. You have worked so hard to get your kitchen to this point, and it is really paying off. It won’t be long before it will all be done and we can all look at it and appreciate what you’ve done. The kitchen looks great! As far as the cabinet color, get your favorite samples, paint them on poster board, tack them up in you kitchen and live with it. You know what you are doing and what you want. You are not afraid to go bold. Whichever you choose, it will be great! Great suggestion! The larger sample boards plus the lighting in the room will help decide which color green to choose. Benjamin Moore Advance Alkyd paint is ah-mazing for cabinets. I painted all my bathroom cabinets with it and that stuff performs like a tank. The formula is perfection, it self levels and after it cures is hard as a rock. I have had not one scratch or chip on it and we are pretty rough on the bathroom!! I did a lot of research and the BM Advance had such great reviews, I am glad I went with it and couldn’t be happier! I love the flow of your kitchen. It looks functional and is going to be beautiful. Is there going to be a dishwasher. If so where. The dishwasher is to the right of the sink. Isn’t the placement of your dishwasher a little far from your cabinets (for unloading the dishwasher)? I love your floor and counters. I also love watching this project take shape. You do great work! I vote for the new green over the Derbyshire. I think it would look better with the white counter tops and back splash. I would be afraid the Derbyshire would come off as muddy against the white and the other is so crisp and clean. Once you do your samples you’ll be able to tell what suits you. Can’t wait to see the green go on those cabinets. I’ve got to disagree with just about everyone here and say go for the Once Upon a Time! I think it would be phenomenal with your whites. It’s so hard finding the right green; one that’s not too yellow, not too blue. This one is just right. In fact, I’m now determined to find something in my house to paint this color! Your kitchen looks amazing. What a great job on the counter tops they are going to be awesome when finished. As for the paint colour, my choice would be more of a light sage. The other greens all look too dark for my taste but I am sure I am going to “eat my words” once it is all done. 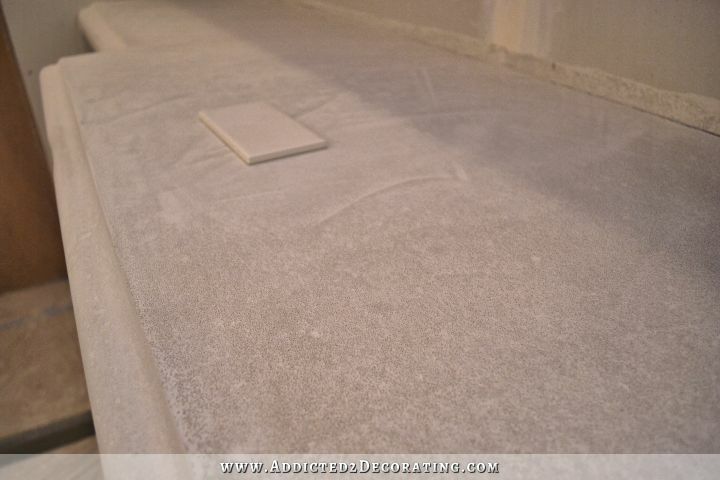 Is the sanding necessary or are you just unsatisfied with the surface? I definitely like the look of it better after the sanding. It just looks and feels more solid and less porous, like actual, solid concrete. And I like that it exposes the aggregate (which in this mix, looks like tiny granules of sand) to give it a more stone-like appearance rather than a solid color appearance. And it does help to even out some imperfections, so I like that. At least the 60-grit does, but it takes a while, and I’m going through the sanding discs very quickly. The higher grits don’t really make that much of a difference, at least not with a regular sander. I have seen people use a wet grinder, and start with 100-grit and work their way up to 3000-grit, and it makes the concrete as shiny as polished granite, and makes the surface as smooth as glass. I won’t be doing that. I actually prefer the more natural look. Thanks. I should have worded my question better. Your answer was exactly what I wanted to know. I liked the process until you got to the sanding. I’ll keep looking for something less messy. Kristi, I just painted my kitchen cabinets last year. Can I suggest since it IS as you said such a big job, that you get both of the paint colors you like in samples and actually paint 2 of the kitchen cabinet doors? It will be a little extra work to repaint the “loser” then I know but it is well worth it. You can even take the doors off the hinges and do the inside of them and set them up that way for looking at against your floor and lighting. I painted mine last summer with latex (Valspar) and they are holding up beautifully. I actually painted 2 doors different colors for several days to make my decision. Of course lighting changes everything and my cabinets look different colors and photograph differently according to the sunlight. But I am glad I took the time. I wouldn’t want to be unhappy with it and have to do again! I still have counter tops and back splash left to do but you can see the paint job here and they have held up and look as good today as they did then! Love, love the kitchen. Kristi, you’re gonna want to start cooking! Like the new green, just maybe on the bottom cabs and maybe the darker color of the floor on the top? Take the crown above the cabinets and put some around the rest of the kitchen ceiling? Paint the trim white. What color for the walls? Heck, I don’t know. Just know that this is going to be a masterpiece! Oh how I wish you were still working with clients! After all, Atlanta isn’t THAT far away. So many of your color choices and many other design choices are right in line with my taste and I’ve been unable to find that in a designer so far. I loved this green the first time you posted the photo. Yes, it’s bold but with your other choices will not be overkill and its so bright and lively while not at all garish. Looking forward to seeing the sample door. Also, I have to hope that you decide to use a latex since I can no longer use an oil based paint (or lots of other chemicals) due to a reaction that causes severe bronchitis. You can imagine how thrilled I am with so many decorating and craft products now being water based! This is getting really exciting since you are at a point where every task makes such a visual difference. How delightful…everything looks amazing! I’m sure you want every detail exactly right, like always, but I am so worried about the concrete patching. I am no concrete expert, but I have used a lot of ready-mixed varieties and prepared smooth portland cement with sand only for crafting items like leaf casts, garden ornaments, trivets, and stepping stones. I’ve been told by a masonry professional (my best friends hubby runs a concrete business and has coached me here and there as I try new projects) that you can’t successfully patch any portland based concrete after it is more than a few hours old–To form a secure hold, it has to be very “green” and not have completed all the chemical bonding that happens as concrete cures. Though it takes 28 days for the full curing process, most of the bonding occurs in the first 12-24 hours depending on temperature and moisture. Like Alta, I am worried that it may just pop off if it gets bumped, or even from temp/humidity changes. Have you asked the company about recommendations? I am afraid to ask, because if it were me I would want to do anything to avoid this, but have you considered just repouring that counter now before everything in your kitchen is finished? I just know how you pursue perfection in everything and I wonder if this is where you may end up later. I love your blog and you are a true inspiration for all of us. 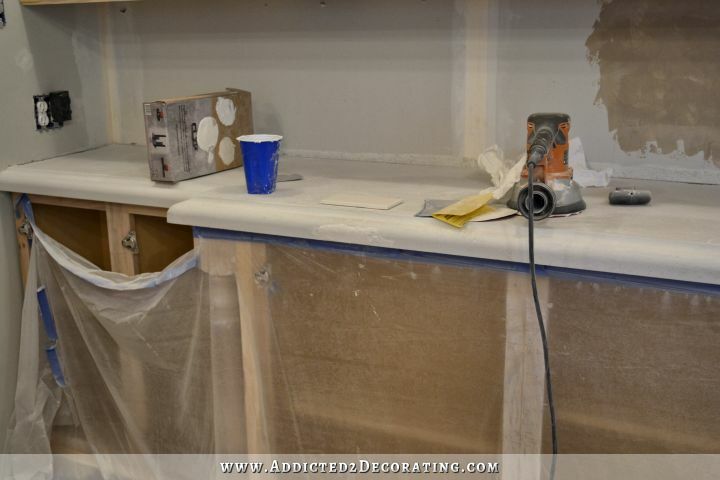 Just a quick note on the using of latex paint on kitchen cabinets….. Speaking as a (now retired) 32+ year domestic services business owner… if you are planning on doing *any* cleaning of the outside of those latex-painted cabinets over the years, most (if not all) OTC cleaners will leave a “tacky” feel to that paint and will henceforth from the very first use, leave layesr of cleaner embedded into the paint with every cleaning that will ‘attract’ dirt, hand oils, grease, etc. like a moth to a flame, leaving that paint surface to never feel or look right again. I used Behr latex paint on our kitchen cabinets over a year ago and have been amazed by how well it has held up. No chips anywhere despite heavy, heavy use. It was my first big painting project and it didn’t even occur to me that the cheaper paint might not hold up. But it has! I have also used BM Advance paint, and I have to admit that I don’t love it. I wanted to love it, I really did. But I didn’t find that it gave me any huge benefits for the 8-hour dry time between coats. Eight hours. Eight. Not eight-but-you-can-really-get-away-with-two. Eight as in eight. If you’re painting cabinet doors, two coats on each side, that’s four days of work at least. Good luck picking a color! Your kitchen looks amazing Kristi!! Another vote for Derbyshire here (in the event you were soliciting opinions, of course) and a second (or third) for Sherwin Williams Pro Classic paint. I painted my cabinets white almost three years ago and they have withstood washings and wear beautifully! 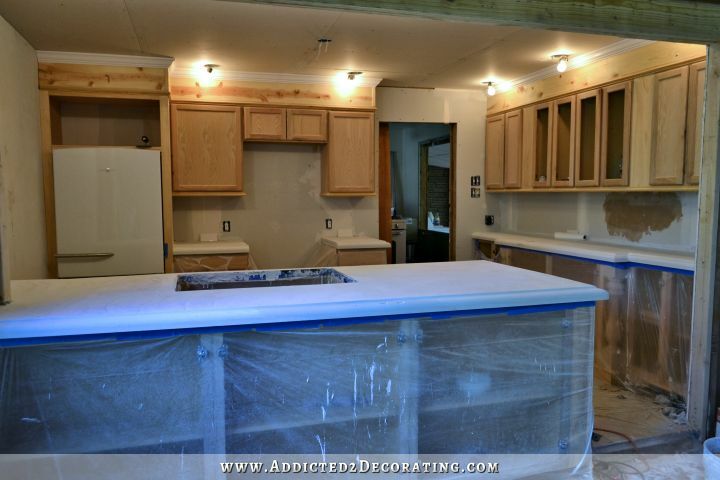 Can’t wait to see your finished kitchen – you have so much talent (and energy)!! Actually here in Canada Melamine paint is recommended/used for cabinets. I wonder if you can get that were you live? You have to use it in a well ventilated space but I painted my mom’s cabinets years ago with it and it has stood the test of time. You can paint furniture with it too. Very durable and doesn’t chip easily. We can’t buy oil based paints here any more because of environmental protection laws that were passed years ago. I painted my kitchen cabinets with a latex enamel about 10 yrs ago and I am happy with how they have held up. It is time to re paint or replace the cabinets… And that is my debate at the moment and it is the main reason I am following this adventure of yours! Thank you! I painted my cabinets with a latex paint. Just make sure you buy the cabinet/furniture paint, it dries nice and smooth. 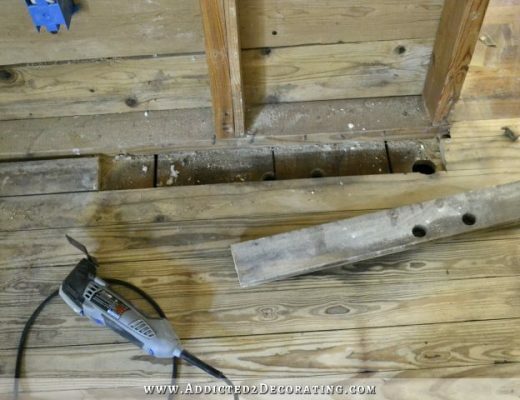 I have a tip from a contractor that he shared on his dyi site. he said that if you want to patch concrete wet the old concrete before trying to put the new wet concrete on top. it will help it stick together. When viewing your whole kitchen, it shows how perfectly efficient your flow plan is. I love both the customized cabinets and the counter tops. I’m not going to give an opinion on the greens because I do not believe you should be swayed by others. Do samples of your favorites and stand them on the counter tops all around the kitchen and live with them for a couple of days. Your favorite will start to pop out at you. I’m glad you’re willing to second guess now, before all that work is done. Actually, I was sort of okey with the counter top that you had sanded through. It added character and definitely gave a vintage feel. LOL. I am also okey with fixes that you can’t hide 100%, but usually prefer the flaw. I know you didn’t like it, so I am glad that you have found a way to fix it. Your new kitchen is so fabulous, that a flaw is needed to give a real vintage feel. Sort of like the Amish deliberately make an error to an otherwise perfect quilt. In the course of repairs at our house, I have also been advised that concrete will not bond to concrete without a really good bonding agent. Something to consider. Now, how are you going to take that breakfast room from cavernous to cozy? You could possibly put deep storage closets across the back. Or maybe a sewing area behind fabric curtains. The fabric would bring warmth into two rooms that almost never have fabric. You probably already have something in mind. Will wait and see your solution. I used a product called Cabinet Transformation. Picked it up at Home Depot (I think). Fail proof for anyone and a fantastic durable finish. Looks fantastic! I love watching your progress. Definitely Derbyshire. Another vote for Sherwin Williams Pro Classic paint as well. Sherwin Williams should be doing another 40% off paint sale sometime soon, just call and ask them when. I have never posted before, but I love your blog, and have been addicted for a while now! We have just moved into our first home, and we are planning a kitchen Reno. I love the layout of your kitchen, I am not sure if we have the space to do the same thing though. If you do know, are you able to please tell me the distance between your fridge cabinets and sink cabinets? Really great job! After seeing your full kitchen view, I can understand why the fridge is on the end. The buffet is lovely. You are such an inspiration! I just love everything you do and your thought process. Thank you for taking the time to share with us! I just finished painting cabinets. I wanted to use an oil based paint tinted a dark blue-green color. But my local Benjamin Moore doesn’t sell oil based paint. They recommended their Advance line. If you find out who will tint an oilbased paint, please share. When I want oil-based paint, I always go to Kelly Moore. I love their oil-based paint, and I also love the fact that you can get most colors in a satin finish oil-based paint. I’m not too crazy about a high sheen paint (no semi-gloss for me), so I always stick with the satin finish. I don’t know, Kristi, I guess you have to go with the one that makes you the happiest. 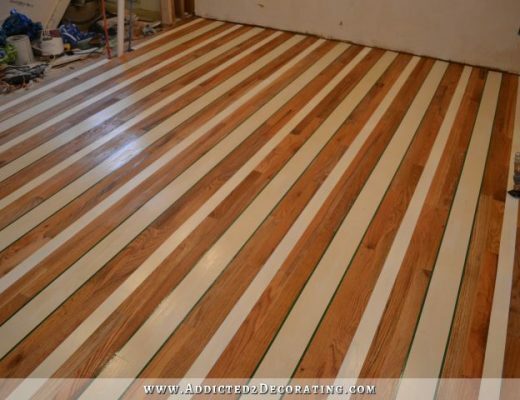 Is it going to be a flat color or will it have the look of Candace’s kitchen with a laquered finish? By the way, is there a reason it will be a breakfast room and not a dining room? I assume it will have a big table with chairs? I like a satin sheen on cabinets, so I’m hoping to find something durable in a satin sheen. Okay, this probably sounds ridiculous, but the only thing that keeps me from calling it a dining room (which, in reality, is exactly what it’ll be) is the fact that for now, and probably for a very long time still, the only entrance to that room is through the kitchen. And it just seems strange to have an official “dining room” accessible only through the kitchen, and not from a living room or family room. 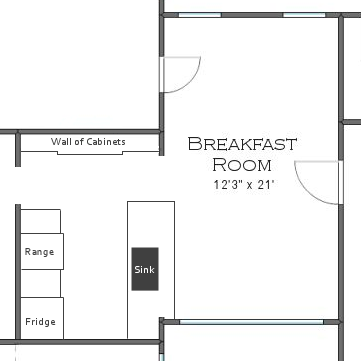 So I call it a breakfast room, which sounds much less formal, and since breakfast rooms are generally expected to be attached right to a kitchen in some way. Having just spent two months doing hard time in painting jail (ie. I painted my entire kitchen) I can give you my two cents about the paints I used for the cabinets. I used Sherwin William’s All Surface Enamel Latex paint for my lower cabinets. This was their only paint that could be tinted the dark gray (Iron Ore) color that I used on my lower cabinets. It was a very thick paint, went on well, is very durable, but I would strongly recommend a tinted primer if you plan to use a dark color. Despite how thick the paint was, I needed to use 3 coats of paint to cover the white primer on the base cabinets. I used the tinted primer on the doors and I only needed two coats of paint. I used Benjamin Moore’s Advance paint for my upper cabinets. It’s a latex paint that has properties of an alkyd paint. It was thinner than the SW paint, but I felt the coverage was a little better. Granted, my uppers are a light gray, so that could account for the coverage. I did use a tinted primer on the doors and again, felt that improved the final color of the cabinets. Overall, I am happier with the Advance paint. I can’t really specify why, I just do. I think it’s a better paint and it feels more durable for the counters. I like the sheen and finish, although both paints did very well. If I were ever so foolish as to take on the project of painting kitchen cupboards, I would go with the Advance paint. Thanks for the overall photo of the kitchen and the floor plan reminders. It looks great and even if the room is small, it appears to have a lot of workspace. The countertops are gorgeous and I’m so envious! : ) Kind of makes you want to whip up a batch of brownies right now, doesn’t it? As for the color doubt, I’m sure you will work it out for your final choice soon. You always do. To me, the original green goes deadish next to the other ‘door’ swatches, and maybe leans toward yellow. I prefer the deeper green of Once Upon A Time, but maybe that’s too blue based I guess the only way you’ll know which color *you* prefer is if you do large swatches and compare them in the kitchen in natural and artificial light. 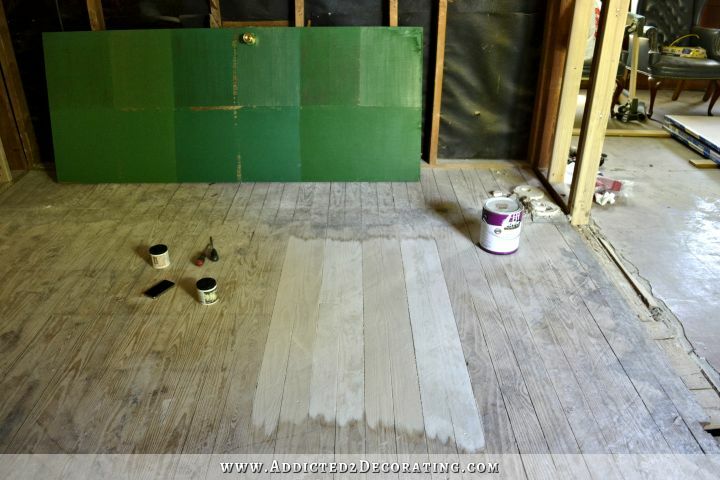 Your door swatch idea is fantastic and gives you a large canvas to really see the color as a complete area. Great thinking! hang your light before you do the paint samples. They will look different under the different lighting conditions. And of course they will look different on each wall of cabinets because of differing light and shadow on each wall. Having primed, painted and antiqued the cupboards in my first house I swore I would never do it again. It is such a huge job you sure don’t want to have to redo it if you don’t like the colour. I did do a second kitchen and the products available now made it a much easier (although still very time consuming ) project. I used a dark green on the base and an ivory white on top and I just loved it. The dark base gave it drama and the light uppers made the room much brighter. Also if you decide on a change in the future you could change just the base or just the uppers with only half the work of the entire set of cabinets.